Avatars, RL fashion and beauty. I read the fashion mags, mostly Marie Claire, Allure and Lucky. Though I do read others on occasion. In the November 2007 Marie Claire, there was one of those "send a staffer out to test a runway trend on the street" 1 page articles by MC's Style Director, Cleo Glyde. In it, she tested out a riding crop, as seen on some runways. Have you seen the magazines lately? They even photoshop Angelina Jolie, apparently even she is not pretty enough in her natural form to be on a magazine cover. And inside the magazines, some of the models look more like dolls (essentially avatars themselves) than human beings. Even in "beauty editor does blurbs on new products" type articles, sometimes the beauty editor is represented by a "chick lit style cartoon avatar" a la the original cover of "The Devil Wears Prada", than herself. Or even compare the pictures of Rachael Ray on her books to her actual appearance on the show. I'm beginning to think that avatars of some sort will replace RL women in print work (the average L'Oreal, Ralph Lauren, Chanel ad) in about 15 years or so. You can see the scoreboard behind me, which can show Team Rankings, World Player Rankings, or Local Ranking. 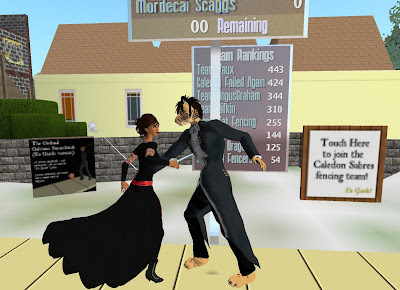 And here are Mr. and Mrs. Scaggs-Despres (Kacy Despres on the left and Mordecai Scaggs on right) engaged in a duel. You click on the score sign attached to the pole to get set up to play. One reason I have my own piste is because I thought about renting it out for fashionista events. For example one could issue fashion prizes to winners of duels or set up tournaments to win a Limited Edition item, that sort of thing. (Though it can't give out items itself currently, I suggested that function to Mr. Habsburg) It's an additional draw for competitive fashionistas. Another plus is that it's low prim, the game itself is 16 prims and a single signboard is only another 18, how cool is that. PDF is a great cross platform format for documents. Readers for Linux, OSX, Windows and other platforms exist. A couple of days ago I needed to send some formatted text with images and PDF was the one format I knew my recipient could almost be 100% assured to handle. In fact, it's probably the best format for sending formatted documents between Linux and the other OS's, since Linux users tend to be not overly fond of .doc, and Windows/OSX users probably aren't going to want to deal with .abw (Abiword) or OpenOffice formats. It's great for SL magazines too, though they should be optimized for screen use and not printing. It's very unlikely that a 70 page SL fashion PDF is going to get printed, and optimizing it for screen mode will make it smaller, faster to load, and work better overall in readers on other platforms, and even on that bloated monstrosity that is Adobe Reader. OSX and Linux have PDF creation support right out of the box. On Linux, even if the application itself can't create PDF's directly, they do output Postscript, which can be ran through ps2pdf on the command line. Windows doesn't have PDF creation support built in. You can install support in Word, and OpenOffice can create them, but the easiest thing is to install a virtual printer that creates PDF's when you print to it. I have one installed that came with a copy of Print Shop, but I've seen PDFCreator recommended. And not just on cakes either. Fashionistas chat with each other, this is what we do, especially when we work with each other. So I was talking with Daisyblue Hefferman, a co-minion of Linden Lifestyles, and she mentioned wanting a horse but not having enough money. I told her that I knew of a place with cheaper horses that seemed pretty cool to me, Virrginia Tombola's Coach House just off the Caledon Eyre telehub. So I popped over there and checked the prices and offered a TP to Daisyblue. And then I saw what she was wearing and wanted to rip it off her right then and there. It reminded me of my third grade teacher Mrs Lowery who was a bit of a "dame" with a taste for classic styles. Mrs. Lowery would have worn something like that, perhaps with a bit less cleavage, though she probably would have worn her red and white spectator pumps. So as soon as I could I bought it too, making my first visit to ICING. It's called Study Date, but IMHO it's way too sophisticated for a student, I think of it as more as "Alluring Librarian", it gets the details right, the sleeves, the belt, the little bow, the books. While at Icing I also picked up this Holiday Party dress, which I love love love, it's just so Donna Reed meets pretty pretty pretty. The skirt moves so prettily and it has a net crinoline. It looks great without the fur capelet too. And yes, I saw lots of other retro-pretty lovelies at Icing that I NEED. ETD Roslin hair in the older Mahogany, and TaP Vivant skin (just lips 2, frameworks glasses, Lassitude &Ennui Eva shoes, pictures taken in Caledon Victoria City. I hate the 25 limit on groups. Really really hate it. But there's social groups and update groups and \I get invited to groups all the time and simply can't join them because I'm at my max. It would make me very happy if more update groups switched to Subscribe-O-Matic. Admittedly, Subscribe-O-Matic is a fee based service and might work best for larger businesses. Of course, all this would be moot if the Lindens would increase the group limit. 100 would be a nice start, 200 would be better, 1000 would be heaven. This post was inspired by the launching of the Le Zoo sim. I like shopping centers in SL, they're a great way for a bunch of small to medium size businesses to pool their marketing advertising efforts and drum up some business.Also i'ts kind of handy to have favourite small to medium designers near each other. However.....I'm not for certain if the concept works in the long term in SL. Why do I think that? Two words...Midnight City. When I joined SL Midnight City was the IT sim, it was the happenin place, it had all the hype all the awesome fashionista parties that I only heard about. But now, it's deserted. It's like "Midnight City, whats that?" That said, I think people should still keep doing them, because I think the concept is sound, it's the implementation that's tricky. 1. I think the sim's owner/creator can't be too busy or absent, or it suffers. If the creator is busy, perhaps they should hire a full time manager to actually run the sim, while they concentrate on on their business. 2. The stores in it can't be too big, or the traffic hurts the sim, neither can they be too small with not enough inventory. 3. The stores have to have new inventory to attract repeat customers. 4. It helps if the stores are full stores and not satellite shops, there's few things more annoying than knowing a store doesn't have the full inventory and having to travel the grid to find the item in the one satellite shop that has it. 5. That said, limited inventory satellite shops might work for large businesses who might want to reduce traffic lag at their main store. For example, a hair creator putting new releases in a satellite shop as well as the main store. 6. I think it helps if the center has areas for just hanging out and having fun, to kind of develop a community. If I had the cash, I'd probably try to start up what I call "the Fashionland/Fashiondonia project." It's inspired by Caledon, which is an obvious success. In Fashionland, I'd have the sims be mixed commercial/residential, a la amicitia, but with perhaps a bit more commercial. Fashionland 1: mixed residential-commercial with some common areas for just hanging out and having parties. Fashionland 2 more of the same if 1 is successful. Port Fashionland, with a sea inlet for more waterfront property. Fashionland Bryant: Big shows and events, with tents and stuff, but set up with a long return time so that it an be used as a kind of sandbox by fashionistas. Fashionland Swirlyland: Swirly Cyclone, gets her own sim, just because. Fashionland Ducalpalooza's: Low prim Island sims for those who need a bigger store/mansion/castle, but don't need a full priced sim. I'll never be able to do it, but I think it would be fun to try, though I imagine Desmond Shang or Anshe Chung could pull it off. Blast, I was hoping to stay hidden. :-) But both Amelia Book and Rose Farina got me. (4) Don't forget to leave them a comment telling them they're tagged, and to read your blog. 8 Things you may not know about me. 2. I love doing accents and impressions, which means that you might want to disable voice in SL when I am near. I also sing, run away, run away. 3. I know my MAC foundation number. 4. I love Hello Kitty. 5. I love pumpkin pie and could eat it all year long. I love making pumpkin pie too, the secret to a good pumpkin pie is in the spices (if you can't see them you didn't put in enough), and in the cooking method. Use a cookie/baking sheet even if the recipes say not to. Using the cookie sheet will increase the time necessary but will protect the oven from filling spills and help bring out the spices. It's also important to sing the Swedish Chef Song when putting in the spices. adding more with the Bork Bork Bork. 6. My favourite drink is root beer. a really good root beer is a rare thing. It should be smooth, but not too carmelized and no fricking caffeine. Root 66 was the best, but it can't be bought here anymore. 7. I used to be able to solve Rubik's cubes, but have forgotten the ending sequences so can only get halfway these days. I could do it in less than 2 minutes if I was doing good. 8. I can't watch trivia/question and answer style game shows on TV, the contestants annoy me.